iCash lets you mix accounts in different currencies. Each currency is identified with its standard ISO symbol which uniquely identifies it, a textual description and the exchange rate with respect to the default currency. ISO codes are made of 3 characters, for example USD for US Dollar, EUR for Euro or CAD for Canadian Dollar. Each account you hold can only use one currency. Currency conversions are handled by transferring money between accounts with different currencies. Each currency has a given exchange rate with respect to the default currency. This enables iCash to calculate the exchange rate in between any two currencies. You need to select the default currency when first using iCash. Most of the currency management is handled through the currency editor. You can access it opening the Edit | Currencies menu. 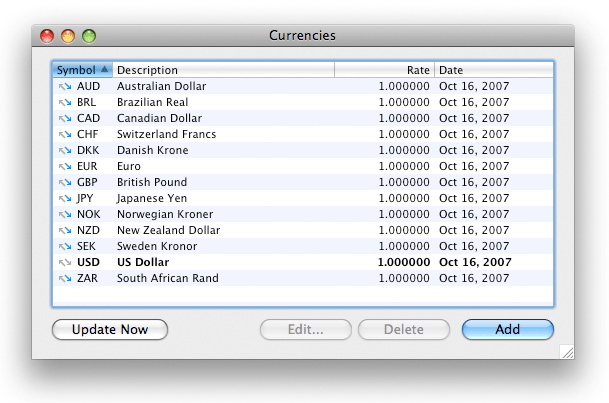 The currency editor enables you to add new currencies, delete them and manipulate existing ones. You can select a currency from the list and then edit it or remove it. It also allows you to update rates through the internet by clicking on the 'Update Now' button or to update a given currency rate by selecting it on the list, right clicking and selecting the 'Update' contextual menu. 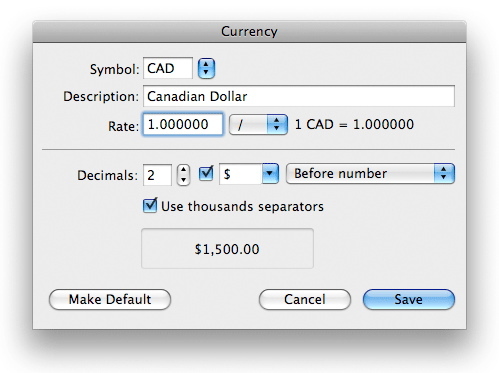 Symbol: When adding a new currency, you can save time by selecting it from the pull-down menu on the right of the symbol field. That way you will use the right ISO symbol and description. You just need to enter the rate and formatting settings. Rate: You can enter the rate as a division or a multiplication. The result is displayed on the right. Formatting: Set the number format, decimals, thousand separator, symbol and symbol position.